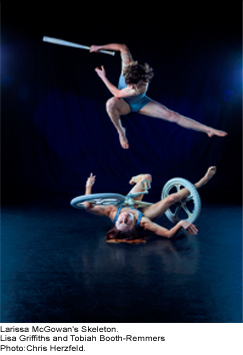 Tanja Liedtke Foundation proudly supports the 2013 Dublin Dance Festival. The Tanja Liedtke Foundation is proud to be supporting the 2013 Dublin Dance Festival which will feature a screening of Life in Movement at the Irish Film Institute during the Festival, to celebrate and remember Tanja’s work and contribution to a new generation of Australian dance. Tanja’s good friend, choreographer and costume designer Theo Clinkard will introduce the screening on 26 May at 2.00pm. The Tanja Liedtke Foundation is also supporting the presentation of the Big Island / Small Island showcase, featuring the work of two rising stars of the Australian dance scene - Stephanie Lake and Larissa McGowan. Big Island/Small Island is being presented from 24 to 26 May.